Lunch at Fountain Dining Hall on Valentine’s Day was extra special for NC State staff and faculty. 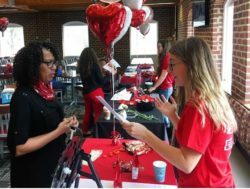 Campus partners, including NC State Dining, University Recreation, and the Human Resources Department, successfully collaborated to deliver a heart healthy tabling session for staff and faculty. The 40+ participants were given a complimentary meal from the dining hall and were invited to attend a heart healthy lunch with their coworkers. Menu items that were classified as heart healthy were marked using a red dress on the menu identifier cards above the served food. Example offerings included broccoli with sweet chili sauce, roasted Italian vegetables, savory hummus, and fresh, ripe strawberries. Both faculty and students alike enjoyed the jaw-dropping chocolate fountain placed at the fruit station, filled with a colorful palette of strawberries, pineapple, cantaloupe, and honeydew melon. Each collaborator had a specified table that highlighted heart health related activities, games, handouts, and supporting information. Once participants enjoyed their complimentary lunch, they were given the option to speak with the three collaborators to expand their knowledge on heart healthy foods, lifestyle tips, and preventative techniques. NC State Dining gave out helpful handouts on ways to eat healthfully on campus, as well as a small flyer promoting heart healthy foods and ways to eliminate food waste. Dining student employees invited staff and faculty to spin the trivia wheel, and upon answering correctly, an array of dark chocolate as prizes. University Recreation performed “Know Your Numbers”, where faculty and staff had their blood pressure taken and were given information on Body Mass Index, heart health, and the importance of physical activity. Lastly, the HR Department gave out beneficial heart health fact sheets and promoted its partnership with the American Heart Association and their new Check, Change, Control blood pressure management program. The event had a positive impact on the staff and faculty of NC State and provided beneficial and preventative tips to promote a heart healthy life.